[INQ. NO. 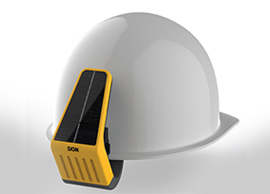 1408E08] Sion Lighting Co.’s helmet solar fan is a solar air cooling fan for use at safety helmets. The product, THS-153, helps protect workers in the construction sites from sunstroke or heat apoplexy. Measuring 144mm x 75mm x 67mm, the model can easily be installed on any kinds of safety helmets due to its specially designed installation part. Operating on a built-in rechargeable lithium ion battery, it does not need any separate dry batteries. 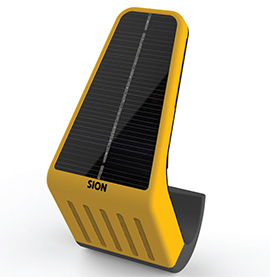 Recharging can be done in two ways — through solar module or USB port. The fan is a specially designed one which is generally used for car navigation system and PCs. So, the fan guarantees stable and stable operation. Once fully charged, it operates about seven hours. And also, Sion Lighting has specialized in producing various power-saving lights for use at dwelling houses, office buildings and hotels. The company has recently entered the limelight by releasing power-saving LED lights with or without a built-in sensor. Measuring ø235mm x 70mm(H), “SSCG-12W” model employs 12W LED lamps (3,000K, 6,000K). “SLCG-12W” model has similar specifications but it does not have a built-in sensor. Other popular LED models with or without a sensor include Sun Flower “SSFG-12W/SLFG-12W” (ø250mm x 40mm), Moon “SSMG-12W/SLMG-12W” (ø240mm x 55mm), Square “SSQW-12W/SLQW-12W” (210mm x 210mm x 90mm), Rose “SSQR-12W/SLQR-12W” (210mm x 210mm x 90mm), Crystal “SSCC-12W” (ø245mm x 55mm) and Ice “SSCI-12W/SLCI-12W” (ø210mm x 65mm). The firm’s hot-selling LED lights without a sensor include bathroom light “SLBR-1L/SLBR-2L” (280mm x 95mm x 95mm/430mm x 95mm x 95mm) and 6” down-light “SLCD-12W” (ø175mm x 65mm). 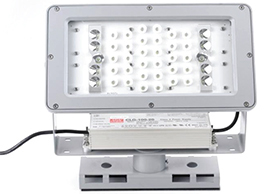 Founded in 1997, Sion Lighting has concentrated on the production of power-saving lights. Based on its accumulated know-how, the company has recently released LED sensor lights, helmet solar fans and LED visor lights. Its products have been actively exported to foreign countries, including the US, UAE and Japan. Over the past 17 years, Sion Lighting has produced various power-saving lights for dwelling houses, office buildings and hotels. Recently, the company has committed itself to developing innovative LED lightings that are the matter of common interest in the world market, as well as, to marketing newly-invented solar air cooling fans for safety helmets. A member of the Korea Electric Safety Association, Sion Lighting has supplied various power-saving lights for office buildings and dwelling houses. The company’s products have obtained the certification of high-efficient energy materials and equipment from the state-run Korea Energy Management Corporation. The firm also has various certificates of registration for its products.